Spokane jazz guitarist/attorney Tim Nodland began his journey as a winemaker with the 1999 vintage, and his work with Pepper Bridge and Seven Hills vineyards in the Walla Walla Valley strikes a chord in a Right Bank Bordeaux style. His blend of Merlot (60%), Petit Verdot (30%) and Cabernet Sauvignon opens with aromas reminiscent of a Mounds bar as toasted coconut and chocolate are joined by cherry and chalkboard dust. The drink is an easy one as fleshy Rainier cherry and Baker’s chocolate carry across a background of dusty tannins and raspberry acidity. 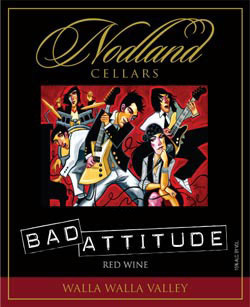 Those who visit his Spokane Valley tasting room will see Florida artist Tim Rogerson’s contribution to the Bad Attitude label on display at this members-only winery.